I Can't Believe It's Not Treif! Stroganoff - Kosher In The Kitch! I Can't Believe It's Not Treif! Stroganoff - Kosher In The Kitch! Beef Stroganoff, a Russian dish with origins rooted as early as the mid-1800’s, boasts a decadent, creamy sauce, traditionally flavored with dry white wine and sour cream. A rather simplistic recipe (with considerable variations throughout the years), a good Stroganoff offers a truly lovely textural and flavor experience. In this version, I used Tofutti’s Sour Supreme as a sour cream alternative. Although I was rather luke-warm to this product by itself, I must say that it’s a dream to cook with, holding up well to light simmering while contributing an authentic tang to the sauce. Serve over a bed of wide noodles; I used spinach egg noodles in this photograph. 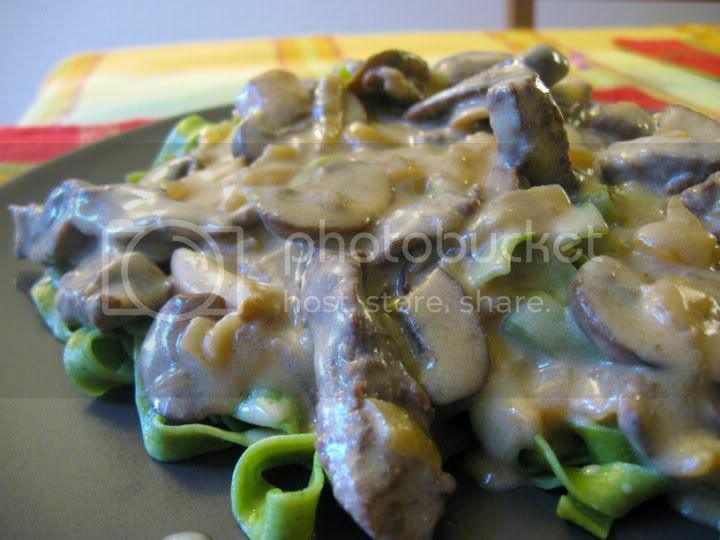 Not only is this rendition of Beef Stroganoff completely kosher, it also has fewer fat and calories than the traditional recipe! Pair this entrée with a cold, dry, white wine. In a large saucepan, brown beef strips in olive oil on high heat. You may need to do this in batches, depending on the size of your pan. Turning heat down to medium high, add a little more oil and sauté garlic and onion until onions are translucent and fragrant. Deglaze with white wine, scraping bottom of pan. Add sliced mushrooms and beef broth (or substitute), cover, reduce heat, and simmer until mushrooms are tender, about 10 minutes. Season with salt and pepper, and stir in Sour Supreme. Add corn starch and water mixture and stir until slightly thickened. The sauce should have the consistency of heavy cream, able to coat the back of a spoon. If it is too runny, add more corn starch. If it is too thick, thin with Mocha Mix, broth, or water, and then re-season accordingly. Serve over broad noodles. In this photograph, I used spinach egg noodles. *This dish pairs nicely with Galil Mountain Voignier. I’ve long been looking for a kosher version of Beef Stroganoff. THANK YOU! I tried this for Rosh Hashana today, it is amazing!! I left out the yeast though. This was so good. My kids loved it. I just mixed beef soup mix and it came out great. I also did 2 tablespoons cornstarch instead of one to make it a bit thicker. Minor changes: I couldn’t find the Tofutti sour cream so I used Tofutti French Onion flavor parve cream cheese, and I also left out the yeast b/c I didn’t have it. The flavor is excellent and very much like the real thing (as I remember it from many years ago, anyway!!). I have a stupid question – I’m about to make this tomorrow for shabbes. I can’t figure out whether you take out the meat after you’ve browned it. I’m assuming that you do but then when do you put it back? after you deglaze the pan? Please help!! Wonderful! Made this last night to rave reviews!! Thank you!